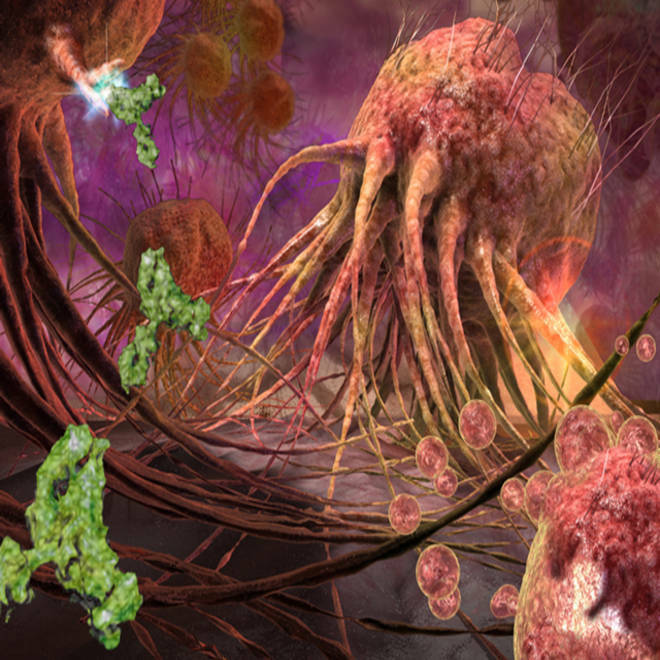 Click through prize-winning photos and illustrations from the 2011 Science and Engineering Visualization Challenge. Visualizing science has come a long way from the days of overhead projectors and boxes of microscope slides — and to see just how far we've come, all you need to do is take a look at this year's top entries in the International Science and Engineering Visualization Challenge. This is the ninth year for the competition, which is sponsored by the journal Science and the National Science Foundation. The 212 entries, received from 33 countries, focused on subjects ranging from transmission electron microscopy to the cosmic web that stretches across the universe. Expert judges selected their top entries in five categories: photography, illustrations, informational posters and graphics, interactive games, and videos. But the general public got in on the judging as well, casting 3,200 online votes to select "People's Choice" award winners. "The talent of these award winners is remarkable," Monica Bradford, Science's executive editor, said in a news release. "These winners communicate science in a manner that not only captures your attention but in many instances strives to look at different ways to solve scientific problems through their varied art forms." Check out our slideshow, featuring the winners in the photography, illustration, poster/graphic and interactive game categories. A mere slideshow doesn't give you the full flavor of the interactive games, however, so you'll really have to give them a try separately. The top-rated game is Foldit, a protein-folding puzzle game that has led to published research. We've written quite a bit about Foldit already: Check out our reports about the AIDS-like virus puzzle that was solved by Foldit players, and the molecular "recipes" that gamers came up with. Three more games merited honorable mention: Meta!Blast 3D, an educational game about cellular biology; Build-a-Body, which lets players put together virtual organ system; and Powers of Minus Ten, which lets players zoom into the structure of virtual cells. Velu the Welder, a game from India that actually trains players to do welding, won the People's Choice award. "High Density Energy Storage Using Self-Assembled Materials" received an honorable mention. This video was entered by Christopher E. Wilmer, Omar K. Farha and Patrick E. Fuller of Northwestern University. "There's No Such Thing as a Jellyfish" also came in for honorable mention in the International Science and Engineering Visualization Challenge. The video was entered by Steven Haddock and Susan Von Thun of the Monterey Bay Aquarium Research Institute and Jellywatch.org. Photography: First place goes to Bryan William Jones, University of Utah, Moran Eye Center, for "Metabolomic Eye." Honorable mention: Robert Rock Belliveau for "Microscopic Image of Trichomes on the Skin of an Immature Cucumber." People's Choice: Babak Anasori, Michael Naguib, Yury Gogotsi, and Michel W. Barsoum of Drexel University for "The Cliff of the Two-Dimensional World." Illustration: Three honorable mentions were cited. Emiko Paul and Quade Paul (Echo Medical Media) as well as Ron Gamble (UAB Insight) for "Tumor Death-Cell Receptors on Breast Cancer Cell." Joel Brehm of the University of Nebraska-Lincoln, Office of Research & Economic Development for "Variable-Diameter Carbon Nanotubes." Konstantin Poelke and Konrad Polthier of Free University Berlin for "Exploring Complex Functions using Domain Coloring." People's Choice: Andrew Noske and Thomas Deerinck (National Center for Microscopy and Imaging Research, University of California, San Diego) as well as Horng Ou and Clodagh O'Shea (Salk Institute) for "Separation of a Cell." Informational posters and graphics: First place goes to Miguel Angel Aragon-Calvo (Johns Hopkins University), Julieta Aguilera and Mark SubbaRao (Adler Planetarium) for "The Cosmic Web." Honorable mention: Ivan Konstantinov, Yury Stefanov, Alexander Kovalevsky and Anastasya Bakulina of Visual Science for "The Ebola Virus." People's Choice: Fabian de Kok-Mercado, Victoria Wahl-Jensen and Laura Bollinger of National Institute of Allergy and Infectious Diseases IRF for "Transmission Electron Microscopy: Structure, Function & 3D Reconstruction." Interactive games: First place: Seth Cooper, David Baker, Zoran Popović, Firas Khatib, Jeff Flatten, Kefan Xu, Dun-Yu Hsiao, and Riley Adams of the Center for Game Science at the University of Washington for "Foldit." Three honorable mentions were cited: W. Schneller, P.J. Campbell, M. Stenerson, D. Bassham, and E.S. Wurtele of Iowa State University for "Meta!Blast 3D Interactive Application for Cell and Metabolic Biology. Level 1: The Cell." Jeremy Friedberg, Nicole Husain, Ian Wood, Genevieve Brydson, Wensi Sheng, Lorraine Trecroce, Kariane St-Denis, David Rowe, Ruby Pajares, Arij Al Chawaf, Shaun Rana and Nancy Reilly of Spongelab Interactive for "Build-a-Body." Laura Lynn Gonzalez of Green-Eye Visualization for "Powers of Minus Ten." People's Choice: Muralitharan Vengadasalam, Ganesh Venkat, Vignesh Palanimuthu, Fabian Herrera, and Ashok Maharaja of Tata Consultancy Services for "Velu the Welder."